Slowly but surely, progress is being made on the scenery at Summit Springs where Dry Creek Coal Tipple #2 will be located. The photos below shows the area with the first layer of ground cover and scenery in place. The weathering on the base of the tipple is finished as you can see in the photo below. All that remains to be added is a bit of coal and coal dust around the conveyor on the first level. Once all of the trees are in place, I'll come back and add additional layers of ground cover, small trees and bushes. Whenever I get deep into a scenery project like this, the area of the layout in which I'm working ends up a mess. The photo below shows how things look right now. In addition to the scenery at Summit Springs, I'm also adding scenery around the west end of the yard at Nelsonville. You can see the new scenery between the tracks in the center of the picture and the fascia. The next step here will be to add the final layer of ballast on the tracks. The area in the right of the picture between the tracks and the fascia will eventually have a speeder shed, two track worker dwellings and some other small buildings. The old passenger car to the far left in the picture will serve as the yard office and will be located further to the right in the photo above. With any luck, I might have the area around Summit Springs finished by the next operating session. Over the weekend, reports surfaced of another mysterious, unattended campfire. Readers may recall that a recent fire on the Forest Park Southern remained undetected for weeks. The fire was eventually found by Pat Doll, the head of all of the Forest Park Southern holdings and the wife of "Smokey" Doll, who is ostensibly in charge of running the railroad. This time, smoke has been seen along the Union Pacific mainline just east of SK Tower in Colorado. Railroad officials and local authorities are scouring the area in search of the fire. Fortunately, recent rains have helped mitigate the chance of a widespread brush fire. Several local residents submitted the photo below of what was believed to be the source of the smoke. After a thorough search by local officials in the area around the bridge, they were unable to locate the fire in the picture. Smoke remains in the area, and local officials will continue to search until the flames have been found and extinguished. Said one local official, "We'll find the source of the smoke, and those responsible will be prosecuted to the fullest extent of the law." The Thayer clan (Stuart and his brother Bill and nephew Pete) stopped by for a visit recently. Pete was able to catch a few trains in action on the railroad. Here's a link to the video: https://www.youtube.com/watch?v=NfDppCTpGsE. Over the past several months, I've been working on the tipple for Dry Creek Coal at Summit Springs. This structure is based upon Virginia Iron and Coal Company's Esco 10-K tipple at Esco, Kentucky. There are several excellent shots of this facility taken by Everett Young in Stephen M. Timko's recent book "Appalachian Coal Mines and Railroads in Color." Due to space constraints, I had to modify the arrangement of the tipple on the layout versus the prototype. Hopefully, though, I've been able to captured the basic feel of the structure and the location. Using the photographs in the book, I drew up plans for the basic shape of the structure. The spacing between the tracks was already established and by using a hopper car as a guide, I was able to determine the height and width of the structure. From there, I simply sketched out the rest of the structure until the dimensions looked close to the picture of the tipple. Below is a shot of the basic framework. Once the basic framework was complete, I went back and added all of the cross bracing. I had planned to use Plastruct angles for the cross bracing, but even the smallest sized angles looked too big. So I opted to use Evergreen scale 2 x 3's instead. The photos below show the tipple with the bracing in place. Part of the challenge of scratch-building a structure like this is figuring out how to construct all of the various components in a way that allows everything to be assembled correctly and weathered appropriately. I knew that I would have to add a conveyor on the first floor of the structure so I couldn't have the top section of the tipple attached directly to the frame. Several other components would have to be built separately as well. The photo below shows all of the finished pieces, with the exception of the top part of the structure, ready for weathering. 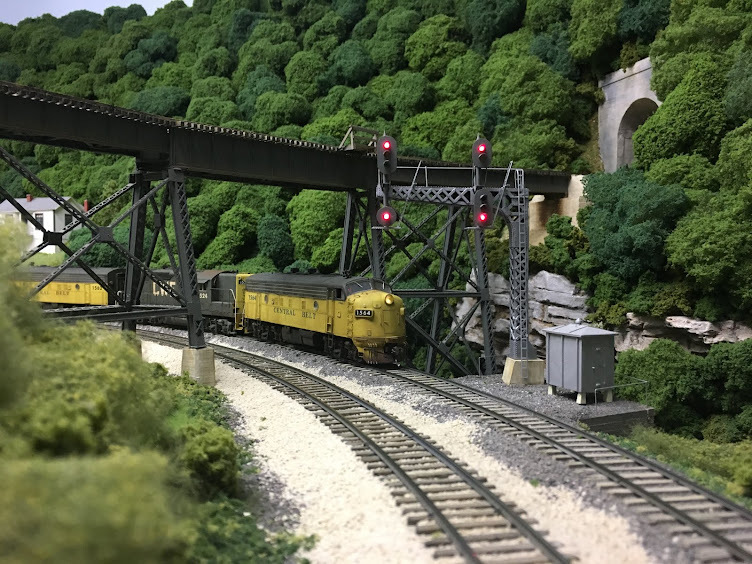 With all of the major components built, painted and ready for weathering, it was time to turn my attention to the scenery in the area. First, I glued a small piece of wood in place to serve as the base for the structure. Then I added plaster to the area around the base until I had a fairly level surface area around the building. Next, I added some plaster to the road across the tracks and laid down the ties and rails for the crossing. I also built a small retaining wall between the tipple spurs and the main line. This helps highlight the vertical separation between the mine spurs and the main line. The photos below show the area at this point. As the Thayer clan (Stuart and his brother Bill and nephew Peter) is stopping by for a visit today, I thought I would set the structure in place so they could see how it's progressing. There's a lot of work yet to be done to finish this scene, but the end is finally in sight! For whatever reason, railroad maintenance of way equipment always seems to appeal to model railroaders. Perhaps it's the unique paint schemes that this type of equipment typically sports, or maybe it's the fact that much of the equipment is specially built or converted from regular revenue service cars. It seems everyone who has ever built more than a handful of freight cars has built some MofW equipment at some point. Many years ago I saw a couple of photographs of 55-ton hopper cars that had been assigned to ballast service on the Clinchfield Railroad. I knew right then that I had found the paint scheme for the ballast hoppers on the CWE and that a few would show up on the layout some day. 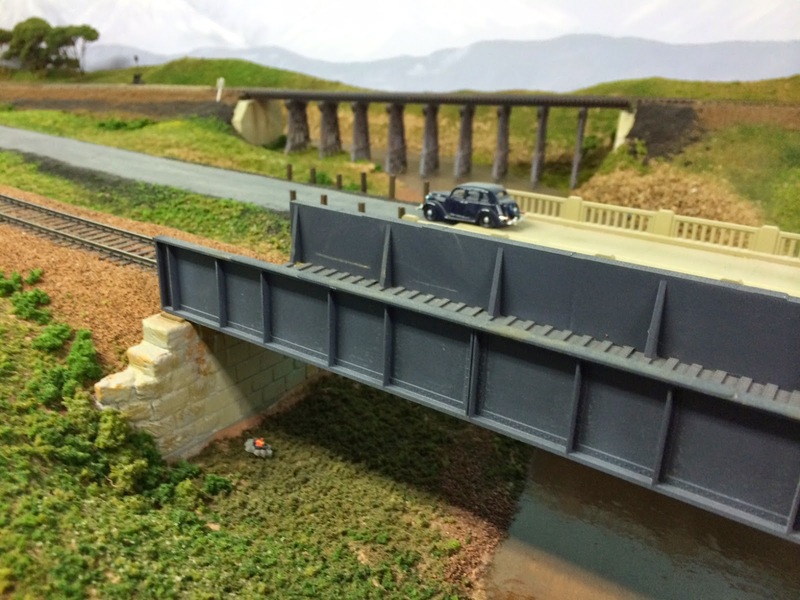 I had originally planned to convert several old Athearn 2-bay hoppers for this project, but once Accurail came out with their 55-ton hopper, I decided to use them instead. They appear to be a very close match to the Cinchfield cars, and the detail on the kits is fantastic. So here are some shots of the recently completed ballast hoppers. The first two are the Accurail cars. CW&E 95034 was weathered based upon the photo below of one of the Clinchfield cars. I'd give credit where due for the photo, but it's another one of those that I picked up off the Internet. Next up are a couple of MDC ballast hoppers with longitudinal doors. 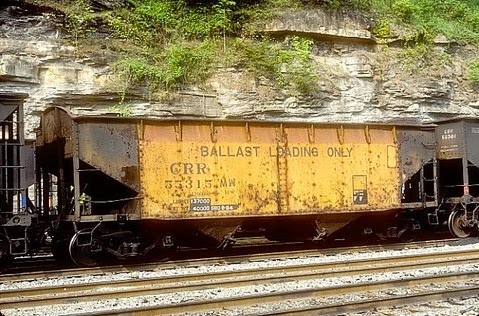 And last up, an Atlas ballast hopper. I picked this up at a local train show for eight bucks and was amazed at the detail: wire grabs, full brake rigging, etc. This is the kind of detail you'd find on a brass model not that long ago. Here are a few down-on shots of the loads. All of the cars were weathered with artist's acrylics, powders and some airbrushing. On CWE 95034, I even added some rust using water soluble oils. The weathering on that car incorporates just about every weathering trick I know! In the shot below, we see the ballast train as it moves out of a pretty empty Hollister Yard. Next time we'll take a look at all of the equipment in the train and explore some ways to incorporate it into an operating session.